Spring Forward with Breakfast! Or brunch.. 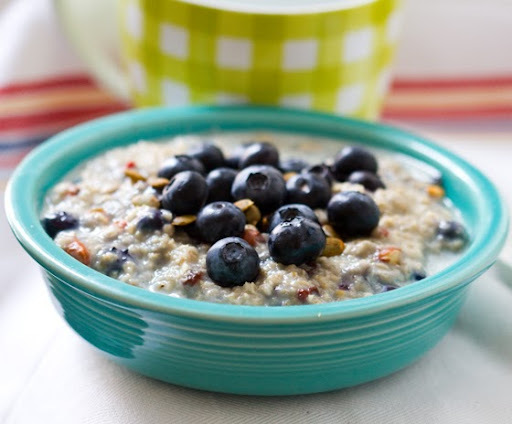 Bright idea: spring forward with a healthy breakfast habit! (like this pumpkin seed-soy-blueberry oatmeal).. The sun is up (your cell says 8am, but it feels like 7am), the alarm has been snoozed too many times and finally you crawl out of bed. Do you streamline your morning to get you in your office chair or off to work as fast as can be? Or do you say "my day can't start before I've had my healthy breakfast." Put the "break" back in breakfast. As in, you deserve an AM break to fuel up!.. New AM Habit: spring forward with breakfast each and every day. A smoothie, tofu scramble, a quickie almond-butter banana toast with soy chai or coffee. I mean really, breakfast is one of those times when you probably have to force yourself to take a break and eat. But trust me, you'll be better off for it. Your entire day may be more productive if you take a quick break to fuel yourself. Be a breakfast PRO - as in Pro-ductive. Brunch at Pure Food and Wine. Hope you all had a lovely weekend! For me, it was one of the first sunny, cheery spring-is-coming weekends here in NYC. 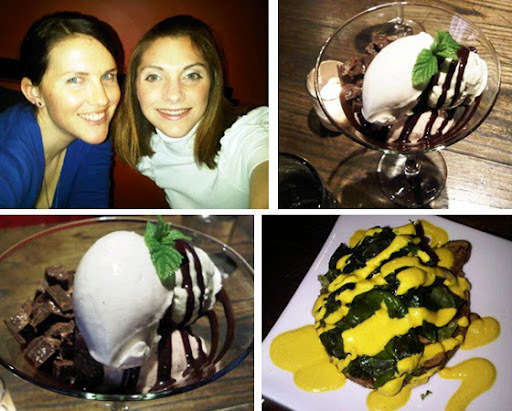 And to celebrate, I went out to Pure Food and Wine's brunch on Sunday afternoon. Though it still felt like Sunday morning from the time change. It was delicious. I had the Spinach Florentine - crimini shrooms, a vegan raw hollandaise sauce, spinach, citrus and more. It was one of my new PFW faves. Amazing. The quiche and crepes my dining pals ordered were also fab. Then for dessert, my bff and I split a Mint Sundae. WOW. Best sundae ever. Really and truly. No guilt attached to this baby.. So don't forget to fuel up with breakfast! Or brunch. Reasons to Join the “Breakfast Club” aka, those who eat breakfast habitually..
side note: last spring I attended the Dole Health and Wellness Blogger Summit - and one of the most important lectures at the event was all about the importance of breakfast. Many of these quips are pulled from what I learned from the Dole breakfast nutrition demo. Many healthy breakfast foods are high in fiber and will satisfy your hungry tummy well into the lunchtime hour. Foods like whole grains, fruit and even veggies. Sometimes I adore veggies for breakfast! 2) You will Eat More Fruit. Fruit is so easy to pair with a healthy breakfast. Try a giant mixed fruit salad filled with seasonal delights. 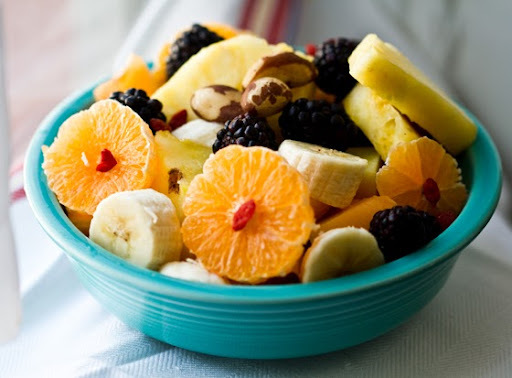 Fruit is fiber, potassium and antioxidant rich. The most antioxidant-dense fruits are usually berries like blueberries and blackberries. You are much less likely to add fruit to your lunch and dinner. So in the morning: fill up on fruit! 3) Metabolism Kickstart! Energy-burning power! Breakfast perks up your metabolic rate and establishes your “point of satiation for the day”. Studies show that people who eat breakfast eat 25% less calories during the rest of the day than those who skip breakfast (this statistic from the Dole Summit lecture). Choose filling, hydrating options like oatmeal, smoothies and more. 5) Be Smart. Brain Power for Kids and Adults! Breakfast has been shown to help improve cognitive ability – which is important for kids and school. Make sure your kids are a member of the Breakfast Club!